First of all I’d like to wish all my visitors a good 2013, may all your wishes come true. I’m still very busy getting things in order for my move and start of my new Job on Monday! 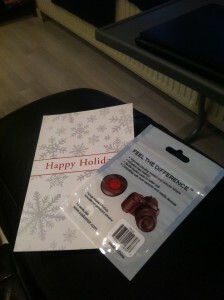 I also got a pretty nice Christmas card from CustomSLR! I was very surprised by that, even more so when I opened it! Not tried them yet but will on my next trip. These guys are seriously awesome!